London: Chatto & Windus Ltd, 1993. 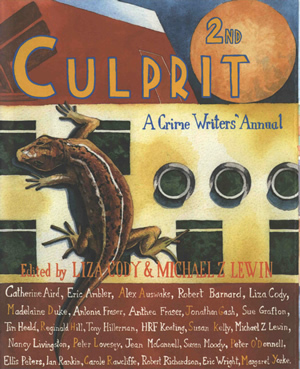 This is the full and detailed view of 2nd Culprit: A Crime Writers' Annual, edited by Liza Cody and Michael Z. Lewin. It contains the story "First Lead Gasser" by Tony Hillerman, beginning on page 140. This story deals with a death row execution that he witnessed while working as the New Mexico manager of the United Press. This volume also contains works by other well-known mystery writers such as Liza Cody, Sue Grafton, and Margaret Yorke. It was published by Chatto & Windus, London, UK, in 1993. This is a paperback volume with cover fold-outs and a clear plastic cover. The jacket design is by Andrea Pinnington and the illustration and lettering are by Julian Abela-Hyzler. The cover features a wraparound pastel illustration. Binding: Full-color paper covers. The book title and a crab logo are printed on the spine.